Invertebrate Embryology: Pteropod Limacina sp. This is a picture of a pteropod mollusc Limacina sp. This pelagic snail swims with its modified foot (which looks like two wings). Although pelagic and tiny (only a few millimiters in diameter), this is not a larva, but an adult. This beautiful semi-transparent specimen is photographed though a dissecting microscope on a dark background. It came out of a plankton tow taken by Alan Shanks on October 7, 2009 just outside the mouth of Coos Bay, OR (near buoy K). 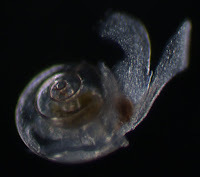 George von Dassow made a time-lapse movie of early embryonic develpment in Limacina and made it available along with many other time-lapse videos of development on the website of the Center for Cell Dynamics (Friday Harbor Labs, University of Washington). Scroll down to the movie called: "Early development in the pteropod Limacina".